The Caribbean Safety and Security Net’s (CSSN) primary mission is the collection and dissemination of accurate information relating to crimes against yachts in the Caribbean, enabling cruisers to make intelligent decisions about how and where they cruise. This is accomplished through the resources and information available on this website, Facebook, Twitter and RSS feed. The CSSN website includes all of the current and historic information on reported incidents (use the Island Reports button to search for/sort the database) Also you can see all posts, (see News & Reports) information and links to a variety of other resources related to safety and security for cruisers (check out the menu at the TOP). Take a few minutes and explore our site. This isn’t hard… we won’t share your name, boat name or email with anyone, ever! Remember – you can subscribe to Email Alerts – Select the Alerts Button to the right and get new reports or new news posts delivered to your inbox. 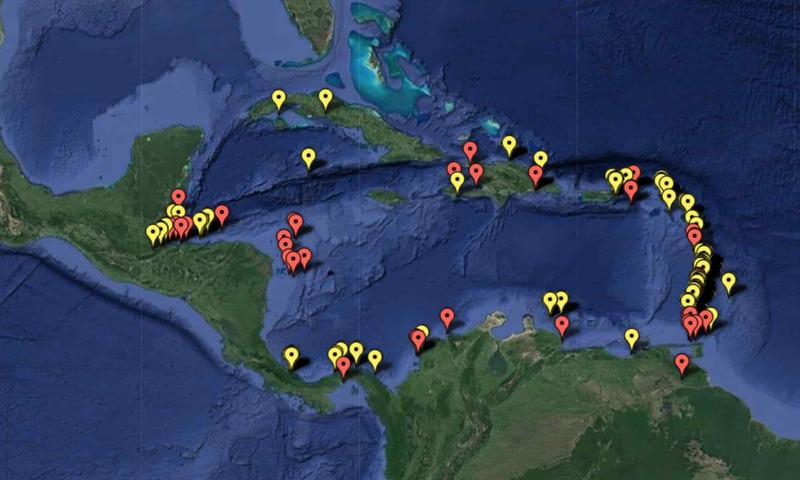 Piracy in Central America – ZOOM-TAP on Marker Pin for incident detail. Piracy in Trinidad/Grenada – ZOOM-TAP on Marker Pin for incident detail. Subscribe to Email Alerts – Know Before You Go! Receive an automatic email alert any time a new Incident Report or new News Item is posted by completing the form below. Sent immediately When there is a new Incident Report or new News. When there is a new Incident Report or new News. When there a is new Incident Report or new News. You can subscribe, unsubscribe or change the kind of alert you receive anytime. It is all up to you. BE THE FIRST TO ... Know Before You Go! To receive automatic email alerts when new Incident Reports and new News items are posted on CSSN, simply enter your First and Last Name, Vessel Name and Email address...select the alert(s) you wish to receive and click SUBSCRIBE. NOTE: If you have slow or weak internet connection consider selecting Low Bandwidth options.. full text only, no graphics and no links. Please select the subscriptions you prefer.